25 Disposable plastic, 1.25 oz. Clear Shot Glasses with Lids. Ceramic Mug Mad Bluebird 15 oz. Great Gift Item. Artist Michael L Smith. Microwave and dishwasher safe. FDA approved food-safe lacquer on inside, smooth styles in bulk and customizeable. Handcrafted, hand wash only. The Ever DrinkWare collection was created with a modern, stemless design and comfort in mind. Our patented signature grooves make these glasses feel even more luxurious and allow for a better grip. Pair that factor with the durability of the Tritan polycarbonate and its the perfect tumber for any beverage. Soft Plastic disposable plastic cups are shatterproof, and made for easy clean up. Perfect for events, bar scenes, picnics, food service, catering and everyday use. 20 cups per pkg. BeerTumbler with lid. BPA-Free VINGO beer tumblers mix fancy and fun and are great for any event where portability is a must. Holds up to 10 oz. The Landmann Smoky Mountain 3495CLA 34-inch Vertical Gas Smoker with Two Heat Saving access drawers to access the wood chip box and water pan without opening the main chamber door and releasing the heat and smoke. This unique features helps keep an even temperature for smoking a variety of meats including turkey, beef, venison, chicken, fish etc. 693-square inch of primary cooking space. Durable welded hinges on the door. Magnetic closures to keep door securely fastened and easily opened. 40 Disposable plastic, 5 oz. Clear Tumblers. Sturdy and durable, Landmann's firewood racks are made from tubular steel with a black weatherproof powdercoat finish. With Decorative Ornamental Scroll design, this log rack neatly stacks wood up off of the ground. Vibrantly printed with VOC-Free, water base inks, the gorgeous art on these 15 oz. ceramic mugs will stay crisp and clear for the life of the product. Everyone loves the generous feel of the handle and the quality feel of the mug. Whether you're playing volleyball on the beach or slaving over the stove in a hot kitchen, the Ashland Chill water bottle makes it easy to stay hydrated throughout the day. Keep drinks cold for the long haul�drinks stay icy cold for up to 18 hours with THERMALOCK� Vacuum Insulation. Easy one-handed drinking. Keep your eyes on the task at hand with the convenient pop up straw on the AUTOSPOUT� lid. Protective spout cover keeps out gross dirt and germs. Leak-proof lid (when closed) provides additional on-the-go convenience. Sleek design fits most car cup holders. Top rack dishwasher safe lid, hand wash body. 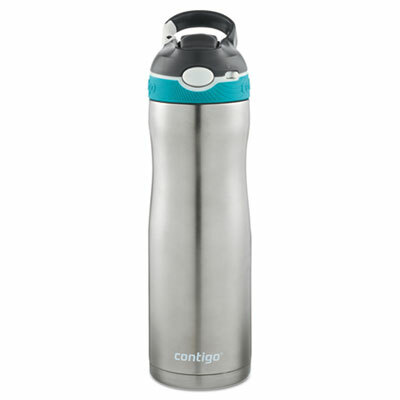 Cup Type: Cold; Capacity (Volume): 20 oz; Material(s): Stainless Steel; Color(s): Scuba. Go ahead, pick your poison. Then conjure up your favorite cocktail creations with BAR BONES Boston shaker. Sized for single cocktails, each graduated glass is printed with 13 ghastly recipes, and holds 9 ounces. Stainless steel shaker is plated with a velvety, soft-touch finish. Eco-Forward� cups are made entirely of plant-based resources. Leakproof biopolymer (PLA) lining (a clean, corn-based plastic). Rolled rim to ensure secure lid fit. Cup Type: Hot; Capacity (Volume): 8 oz; Material(s): Double-Sided PLA-Lined Paper; Color(s): White/Green/Orange. 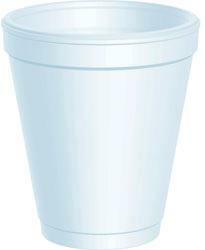 The first-ever FDA compliant PCF paper cups. Made from a minimum of 90% plant-based renewable resources and a minimum of 10% post-consumer recycled fiber. Features environmental Bare� by Solo� design and common lid fit. 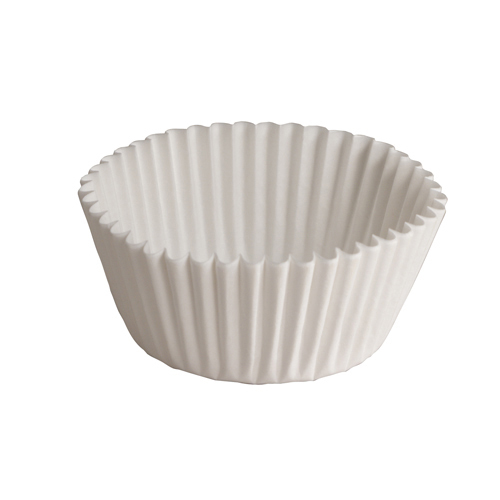 Cup Type: Hot; Capacity (Volume): 10 oz; Material(s): Poly-Coated Paper; Color(s): White/Green/Beige. The first-ever FDA compliant PCF paper cups. Made from a minimum of 90% plant-based renewable resources and a minimum of 10% post-consumer recycled fiber. Features environmental Bare� by Solo� design and common lid fit. 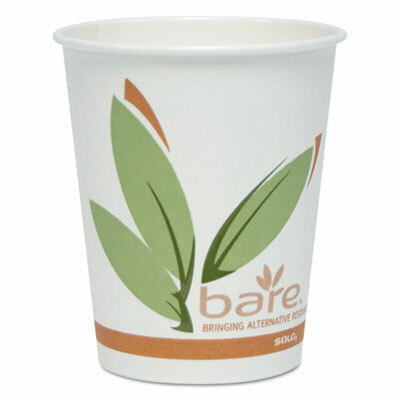 Cup Type: Hot; Capacity (Volume): 10 oz; Material(s): Poly-Coated Paper; Color(s): Green/White. The first-ever FDA compliant PCF paper cups. Made from a minimum of 90% plant-based renewable resources and a minimum of 10% post-consumer recycled fiber. Features environmental Bare� by Solo� design and common lid fit. 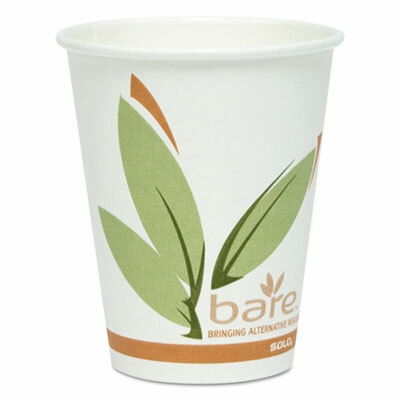 Cup Type: Hot; Capacity (Volume): 12 oz; Material(s): Poly-Coated Paper; Color(s): Green/White. The first-ever FDA compliant PCF paper cups. Made from a minimum of 90% plant-based renewable resources and a minimum of 10% post-consumer recycled fiber. 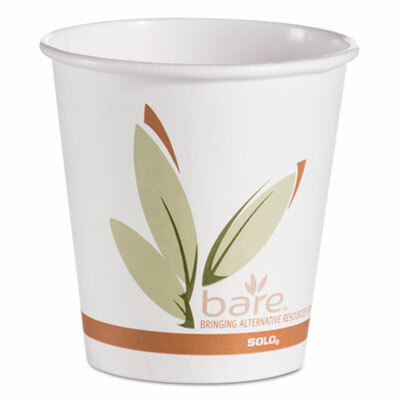 Features environmental Bare� by Solo� design and common lid fit. 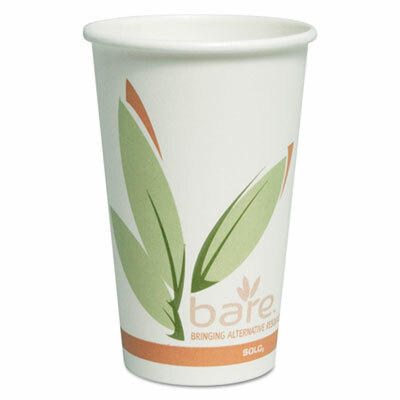 Cup Type: Hot; Capacity (Volume): 16 oz; Material(s): Poly-Coated Paper; Color(s): Green/White. The first-ever FDA compliant PCF paper cups. Made from a minimum of 90% plant-based renewable resources and a minimum of 10% post-consumer recycled fiber. Features environmental Bare� by Solo� design and common lid fit. Cup Type: Hot; Capacity (Volume): 20 oz; Material(s): Paper; For Use With: SOLO� CL316, TLP316. The first-ever FDA compliant PCF paper cups. Made from a minimum of 90% plant-based renewable resources and a minimum of 10% post-consumer recycled fiber. 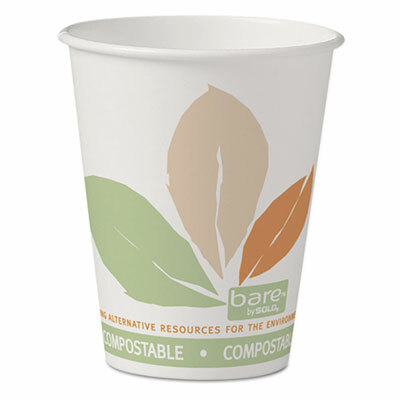 Features environmental Bare� by Solo� design and common lid fit. 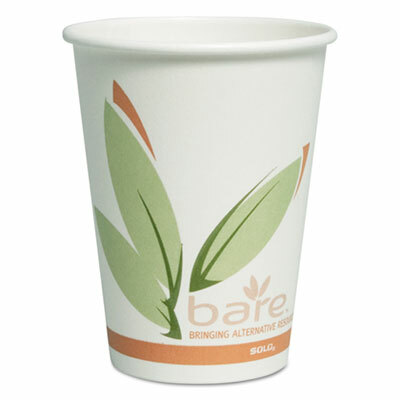 Cup Type: Hot; Capacity (Volume): 8 oz; Material(s): Poly-Coated Paper; Color(s): Green/White. The first-ever FDA compliant PCF paper cups. Made from a minimum of 90% plant-based renewable resources and a minimum of 10% post-consumer recycled fiber. 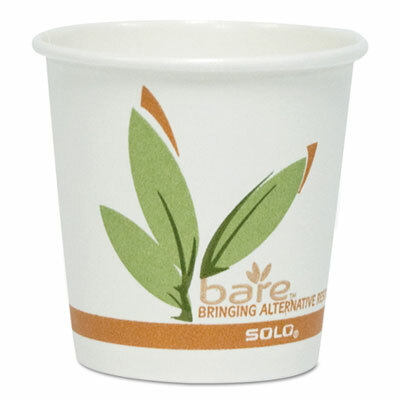 Features environmental Bare� by Solo� design and common lid fit. Cup Type: Hot; Capacity (Volume): 10 oz; Material(s): Paper; Color(s): Green/Beige. 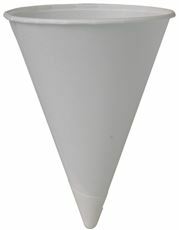 Solo�4.25 oz rolled rim cone treated paper cups help keep things sanitary around the water cooler because they can't be put down and left behind. 200 per tube 25 tubes per case 5000 per case. The 24oz Acrylic Tumbler has a screw-on plastic lid and double-wall BPA-free construction. The lid features a unique locking flap that securely seals the lid to prevent spills. Vacuum Insulated, double wall insulated seamless 18-8 food grade. Won't sweat with hot or cold drinks. Spill proof, BPA free screw on lid. Unique embossed pattern provides a sure grip. Keeps hot drinks hot, cold drinks cold. Attractive coffee-themed cup is ideal for hot beverages. Brings upscale appearance to any food service. 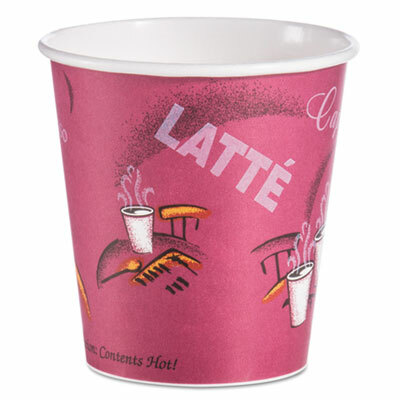 Cup Type: Hot; Capacity (Volume): 10 oz; Material(s): Poly-Coated Paper; Color(s): Maroon. 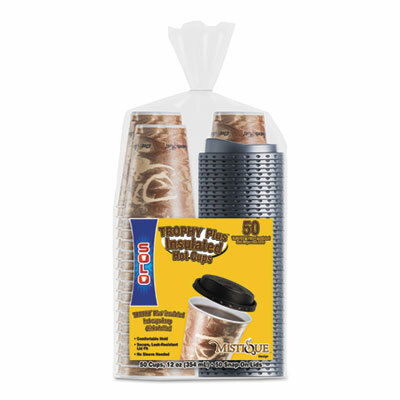 These thin-wall foam cups are insulated to help maintain heat inside the cup and keep fingers comfortable. This eliminates the need to double-cup or use a sleeve. Cup Type: Cold/Hot; Capacity (Volume): 12 oz; Color(s): Brown; Theme: Mistique�. Beautiful bistro mug has a nice shape and a high curved handle making it comfortable to use. Consists of a glossy molded ceramic compound for durability without making it heavy or cumbersome. Dishwasher safe. Cup Type: Hot; Capacity (Volume): 15 oz; Material(s): Ceramic; Color(s): Charcoal.